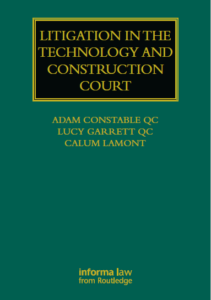 The first edition of Litigation in the Technology & Construction Court was published in September 2018. 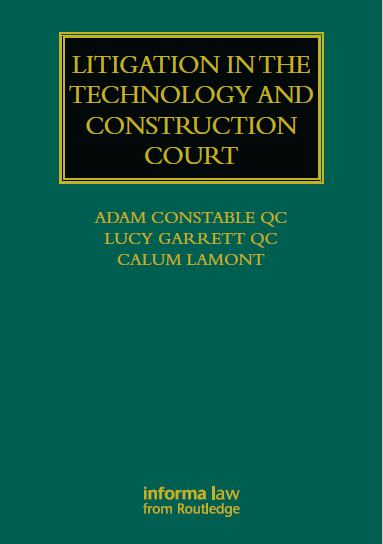 The book, written by Adam Constable QC, Lucy Garrett QC and Calum Lamont, provides a discussion of practical guidance and ideas for practitioners in the TCC. It draws upon the extensive experience of these members to consider the key features of litigating in the TCC, including costs, time limits and expert witnesses, as well as providing a comprehensive guide to processes and other forms of dispute resolution. In their forewords to the publication, Lord Justice Peter Coulson comments “I expect [the book] to become an indispensable part of every construction lawyer’s bookshelf or electronic library” and Sir Peter Fraser notes “I commend this book to those who litigation in the TCC, and look forward to experience its beneficial effects upon the already high standards of practitioners”. This book was first published by Informa Law from Routledge and is available to purchase on their website.